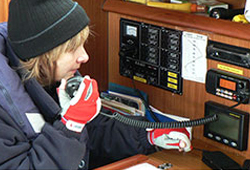 This course is run under the auspices of the RYA, on behalf of the MCA, and is essential for anyone wishing to be able to use a marine VHF radio without supervision. – Guided self study, using the course book and itemised assignments, to gain familiarity with some aspects of radio theory (notionally 3 hours). This should be completed prior to the course commencing. Much of the course is practical, utilising computer simulations and practice marine VHF radios. Emphasis is placed on Digital Selective Calling (DSC), and the Global Maritime Distress and Safety System (GMDSS). The correct use of the equipment, of the designated channels, and of recognized procedures is stressed. The use of the radio in emergency situations is given particular prominence. Course members are expected to know the phonetic alphabet prior to the course, and to be able to write out the May Day call and message in the prescribed format. (i) A short written paper. (ii) A short practical test on the use of the equipment and procedures taught. The fee for the course, including the course book, is £90 per person. Please note that an additional fee of £60 is payable to the RYA for the certificate, upon successful completion of the course. No Courses Currently Scheduled – Please enquire for future dates.